St. Augustine Cemetery serenely sits upon the crest of a hill overlooking the tranquil Naugatuck River. The acreage once held but a handful of those who had shaped our future, but today the hallowed ground has become a testament to those whose faith carried them through the centuries and the years filled with the changes that affect our lives today. As you look over the hillside there are graves of military veterans from the Civil War to the armed conflicts we are involved in today, including one of the first Vietnam War causalities from Seymour, there is a small section that holds the graves of children who passed away during typhoid and smallpox epidemics, a section where several of the priests who served in Seymour Catholic churches have been buried, and graves of many of the residents who helped build our town. 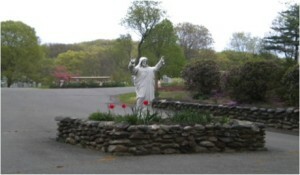 Today the cemetery is kept as a place of peace and serenity for those who visit their loved ones. All our veteranâ€™s graves are proudly marked yearly with American flags and flowers and statutes adorn many of the graves. 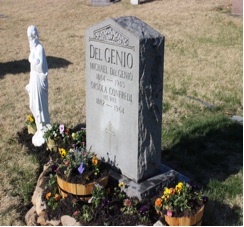 In early 2014, Father Kombo established St. Augustine Cemetery Board consisting of 7 parishioners and himself. These people have with a wide variety of experience and backgrounds and will be responsible for overseeing all facets of the maintenance and management of the property. There are a number of projects that need to be addressed in the coming years to keep our cemetery up-to-date and as a place of peacefulness and beauty. However, every day is a challenge to keep the grounds under a continual check looking for the negative effects of variations in New England weather on the conditions of the ground, the roads and water systems, the aging monuments and unfortunately vandalism. The Cemetery Board members are Arthur Paquette, Cemetery Director; Paul Bockisch, Ann Chepulis, John Hatfield, Alese Kummer, Anthony Montefusco and Reinhold Wilhelm. 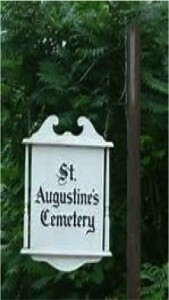 Saint Augustine Cemetery is located on Cedar Street in Seymour. Although closed during the winter months, it is maintained throughout the other months so that it continues to be a place of dignity and rest for all those who have gone before us. We take this position seriously and twice a year do a complete clean-up of the entire area. This includes raking, and discarding decorations and items left behind. In the Spring we refresh and clean the flowering gardens so that new growth will show itself with the sun warmth and be reborn. This committee is a wonderful opportunity to show your appreciation not only to the beauty which God has created but also as a respect for our departed loved ones. The only Spring/Summer planting allowed will be that of flowers, either annual or perennial and only within the area in front of the upright monument and no wider than the base, for a depth of 12 inches. Any planting beyond this area will be removed. Planting of trees, shrubs or bushes of any kind will not be permitted. There is no planting around flush markers. The following are not allowed at any time: fencing, metal, glass or plastic containers, artificial flowers or decorations and no placing of objects of any kind on the grave or monument. Please check with the church rectory regarding regulations for winter decorations. Anything deemed unsightly by the Cemetery Director will be removed by order of the Pastor and Parish Trustees.